The norm is to serve the meatballs with boiled spaghetti but this time I decided to pop the plates into the oven for a few minutes, so the lovely cheese will melt! Also, I did not have any fresh basil at hand, so I used pesto which actually gave them an interesting and lovely taste! Recipe amounts below, make two/three generous portions. Combine well the meatball ingredients. Shape into small meatballs and set on a tray. Heat a little olive oil in a large pan and sauté the meatballs until brown. Take them out of the pan and set aside. In the same pan, sautée the diced onion until translucent. Add the garlic, cook for a few seconds, stirring, and add the red wine. Cook until reduced. Add the passata, the tomato paste, the stock powder, chilli, herbs, bay leaves, sugar and season with salt and pepper. Bring to the boil, lower the heat, add the meatballs gently and simmer for about 20 to 25 minutes. In the meantime, boil the spaghetti until al dente. Drain and place in pot again. With a slotted spoon, take out the meatballs and place on a plate. Reserve 3/4 cup of sauce and throw the rest of the sauce into the spaghetti. Combine well. 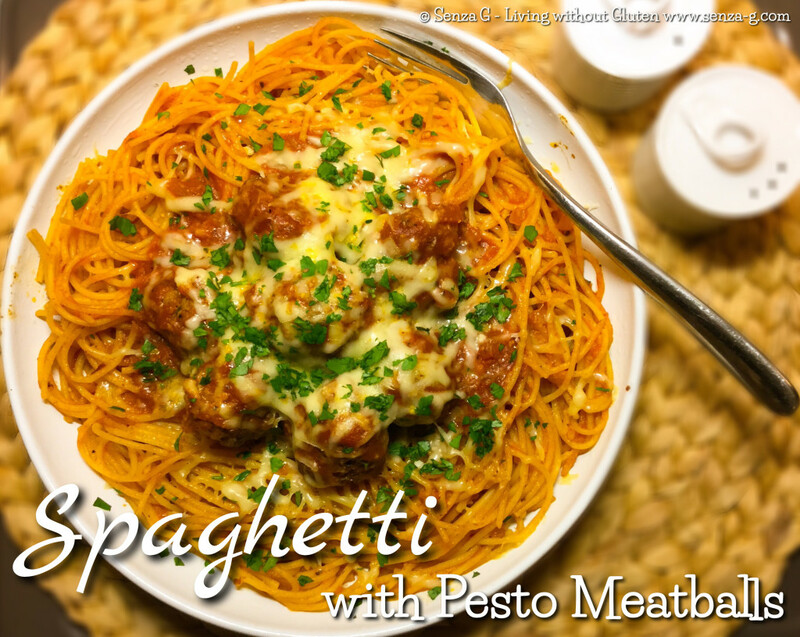 Divide the spaghetti into two/three greased, oven proof individual dishes. Divide and place meatballs on top and drizzle with the reserved sauce. Sprinkle the tops heavily with the grated cheese. Place in a preheated oven of 180C until the cheese melts.